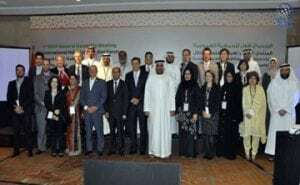 DUBAI: Signalling a new milestone in the global Halal industry, the International Halal Accreditation Forum (IHAF) convened for its first General Assembly meeting in Dubai. This set in motion the official activation of the world’s first global Halal accreditation network. The General Assembly has approved a number of resolutions including a recommendation for IHAF to forge a Memorandum of Understanding with the International Laboratory Accreditation Co-operation (ILAC) and International Accreditation Forum (IAF) in order to explore collaboration in maintaining global standards in Halal conformity assessments. This will play a vital role as the membership application of interested Halal accreditation bodies can be supported by their existing membership in ILAC and IAF. Halal accreditation bodies monitor the entities involved in testing, certifying and verifying Halal products, ensuring that all standards are enforced to give assurance to the consumers that each Halal product is safe, of high quality and full compliance with the Islamic Sharia. IHAF, on the other hand, will ensure that these Halal accreditation bodies strictly and consistently adhere to the principles of Islamic law. During the meeting, Mohammed Saleh Badri was officially appointed as the Secretary-General of IHAF. Badri was selected based on his extensive experience in the field of accreditation and conformity assessment including his previous role as the Director General of the Emirates Authority for Standardization and Metrology (ESMA). At the General Assembly meeting, Dr. Rashid Ahmed Bin Fahad, UAE Minister of State and Chairman of Emirates Authority for Standardisation and Metrology (ESMA), was appointed as Chairman of the IHAF while Peter Unger, President Emeritus at American Association for Laboratory Accreditation, was appointed as Vice-Chairman. Representatives from Emirates Authority for Standardisation and Metrology, American Association for Laboratory Accreditation, GCC Accreditation Centre, Joint Accreditation System of Australia and New Zealand, The National Bureau of Agricultural Commodity and Food Standards (Thailand), Pakistan National Accreditation Council, and Egyptian Accreditation Council, as well as a representative from Latin America and a representative from Europe form the IHAF Board of Directors. Dubai, Nov. 29 (BNA): Dr. Rashid Ahmed bin Fahad, UAE Minister of State and Chairman of Emirates Authority for Standardisation and Metrology (ESMA), was appointed as chairman of the International Halal Accreditation Forum (IHAF). His appointment was announced during the Forum’s first General Assembly meeting, convened recently in Dubai to set in motion the official activation of the world’s first global Halal accreditation network. Mohammed Saleh Badri was also officially appointed as the secretary-general of IHAF. Badri was selected based on his extensive experience in the field of accreditation and conformity assessment including his previous role as the director-general of the Emirates Authority for Standardisation and Metrology (ESMA). A number of committee appointments were announced during the meeting. Kylie Sheehan, General Manager Operations at Joint Accreditation System of Australia and New Zealand, was appointed as chairperson of the technical affairs committee, according to UAE News Agency (WAM). Brahim Houla, Accreditation Services Manager at GCC Accreditation Centre, will serve as chairperson of multi-lateral recognition arrangement committee. Amina Mohammed Hassan of the Emirates National Accreditation System (ENAS) was appointed as chairperson of marketing and media committee. The Assembly also approved a number of resolutions including a recommendation for IHAF to forge a Memorandum of Understanding with the International Laboratory Accreditation Co-operation (ILAC) and International Accreditation Forum (IAF) in order to explore collaboration in maintaining global standards in Halal conformity assessments. This will play a vital role as the membership application of interested Halal accreditation bodies can be supported by their existing membership in ILAC and IAF. Halal accreditation bodies monitor the entities involved in testing, certifying and verifying Halal products, ensuring that all standards are enforced to give assurance to the consumers that each Halal product is safe, of high quality and full compliance with the Islamic Sharia. IHAF, on the other hand, will ensure that these Halal accreditation bodies strictly and consistently adhere to the principles of Islamic law, WAM reported.